This Z has a long history behind it – complete with a racing pedigree and a simple but successful front-engine, rear-wheel drive formula. The 350Z had six-year production run that resurrected the name and brought the car back to the legions of faithful that followed it. But six years is a lifetime in the automotive world, and the same car that had wowed enthusiasts and critics alike when it debuted in 2002 was starting to look its age in 2008. Nissan knew the Z needed new bones, but could it improve on its tried and true formula while staying true to its roots? To do so, the new Z would need a rival – something that epitomized the term sports car in the minds of everyone of every age. It chose the Porsche Cayman S. To have a chance, the car would need more power, better fuel economy, a trick transmission and an interior to match the luxe-German coupe. The 2010 Nissan 370Z not only meets those requirements, but it exceeds the expectations of everything a Z should be, at about half the price of the Porsche! Now, Nissan has released a limited edition of the iconic Z, the 2010 370Z Touring 40th Anniversary Edition. 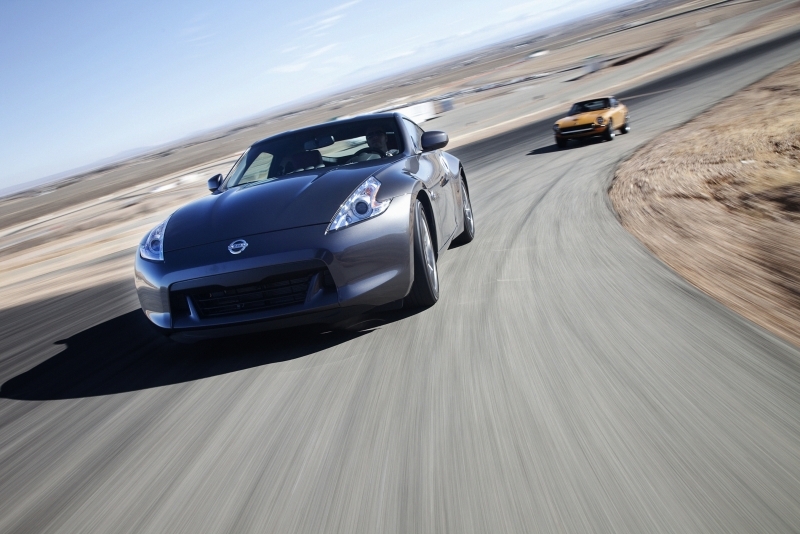 The 370Z takes on all of the lackluster areas of the previous generation. Where there once were flimsy, hard plastics and materials in the cockpit, we now get an up-market and high-class interior. Horsepower is up to 332, thanks to a new 3.7-liter V-6 engine and the six-speed manual transmission with a Nissan first SynchroRev Match technology makes anyone look like a heel-toe driving champ. 40th Anniversary Edition paint and wheels set the Z apart. Nissan does offer a technology package to satisfy your tech tooth, complete with an impressive traffic-aware navigation system and on-board music storage, but you’ll have to pay for it. Some cars are built to ferry you and your possessions from point A to point B, others to make you think you could have had a crack at being a professional racecar driver. The 370Z falls into the latter category. Nissan stripped some serious size and weight from the last iteration to maximize all 332 horsepower under the hood. Nissan was able to do this by building traditionally heavy body parts out of light-weight aluminum – doors, rear hatch and hood all get the Weight Watchers’ treatment, helping to get the car’s curb weight down and weight balance to the magic 50/50 number. The Z is available with either a seven-speed automatic or a six-speed manual. We think the manual version, which sports an innovative feature that matches the engine’s revolutions to the next gear to make for smoother gear changes, is pretty darn cool. Also, thanks to multiple chassis braces and a reworked suspension, the 370Z’s handling characteristics are largely neutral. We also like that Nissan went smaller and more nimble with Z. With a 3.9-inch shorter wheelbase and a body that is close to three inches shorter, the Z is made to be thrown around like a ballroom dancer on a three-week steroid bender. Though the 370Z is an improvement on every level over its predecessor, this is really where the new car shines. 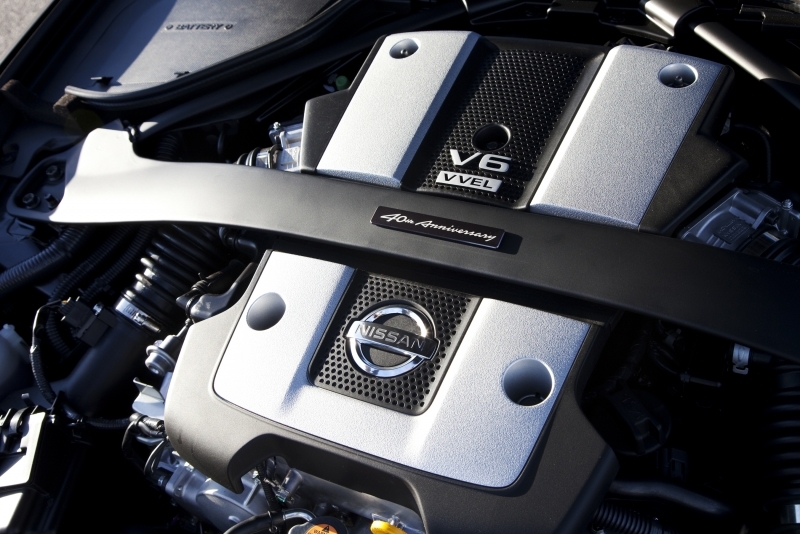 Nissan bestowed a 3.7-liter version of its VQ V-6 on the new Z, complete with 332 horsepower and 270 lb-ft of torque. 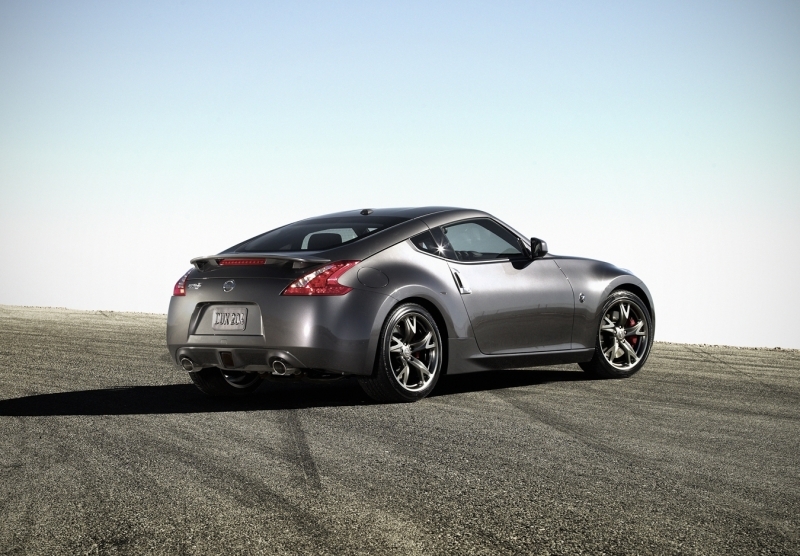 Behind the impressive engine, the 370Z sports a six-speed manual only. The 370Z Touring 40th Anniversary doesn’t have much to brag about on the tech front, besides Bluetooth and SynchroRev Match; it’s meant to be lightweight and a basic canyon carver. The 370Z Touring 40th Anniversary should serve up 18 mpg city, 26 mpg highway. While those numbers aren’t going to save the planet anytime soon, they are more than respectable for a true sports car. 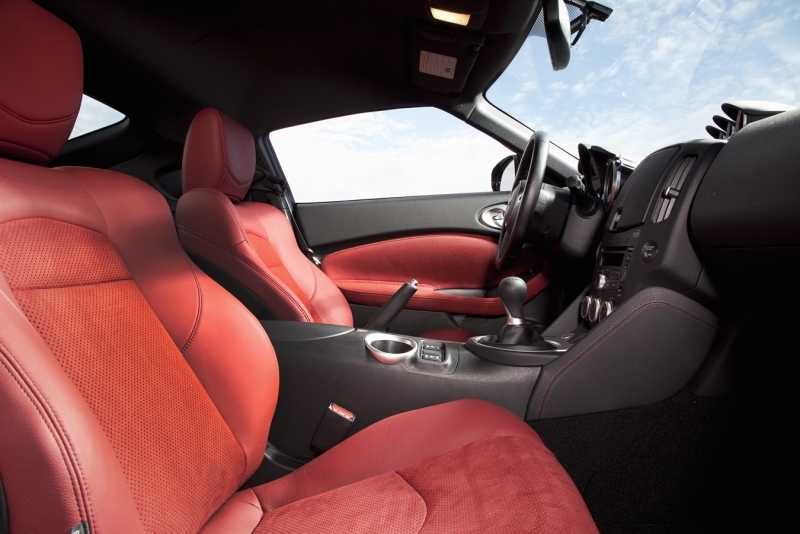 The 350Z suffered from a fairly disastrous interior, and that’s something the engineers at Nissan have remedied in the 370Z. Fine materials, great seats and a truly stylish dash are all welcome changes inside. For the 370Z Touring 40th Anniversary, there is a 40th Anniversary badge on the rear deck lid and the engine bay front strut tower brace, specially fitted car cover with 40th Anniversary logo, red leather and synthetic suede seats with an embossed 40th Anniversary logo, red door panel inserts, red accent stitching throughout interior, embroidered floor mats with 40th Anniversary logo and a 40th Anniversary commemorative plaque between seats. Outside, the 370Z gets a strong dose of classic styling. The long, sloping nose, arched fenders and notched sail window are all bits taken from previous Zs, while the slicked headlights, fanged front fascia and sculpted rear bumpers are all good-looking modern touches. Some may love the new design, others, not so much, but the new Z will get tongues wagging. For the 370Z Touring 40th Anniversary, this model features a unique 40th Anniversary graphite paint job, a smoked wheel finish and some sweet red brake calipers. The 2010 370Z Touring 40th Anniversary Edition starts at $38,860 – about $1,100 more then a standard 370Z touring, which puts it in league with other front engine, rear-wheel drive sports cars like the new 2011 Ford Mustang GT Premium at $32,845 and the 2011 BMW 135i at $36,050 and, dare we say, the Porsche Cayman at $51,400. For the price, it’s hard to beat the performance of the Z.
Nissan has managed to revamp and reboot the Z for a new generation, giving it a much-needed facelift and adding the brute force and well-honed finesse the Z needs to compete with cars costing nearly twice as much. While the 370Z Touring 40th Anniversary doesn’t break any new ground, this limited edition model is for both the Z fanatic and purist. The 3.7-liter V-6 provides immediate thrust, reined in by serious brakes and a well-sorted suspension and chassis. The 370Z evolves a marque that was born with performance at its heart, and it does so without losing sight of what earned the car its following.